Continuity mistake: During Count Olaf and his theatre troupe's performance in the front hall, the bannister and the newel post wobble when Count Olaf grabs it. Revealing mistake: Near the end of the episode when the Baudelaires are in bed, the camera goes outside and pans down the front of the house. Once it reaches the next set of windows below the Baudelaires' "bedroom", the camera wobbles slightly. Continuity mistake: The sticker of the smoked mackerel that Lemony Snicket places on the weather chart completely changes position between shots. Trivia: Count Olaf notably has a tattoo of an eye on his ankle, which is often shown throughout the series. Actor Neil Patrick Harris actually ended up getting the tattoo done for real to celebrate after the series was picked up for a second season. So whenever the tattoo is visible in seasons two and three, it's not makeup... it's real. Trivia: The series stars Neil Patrick Harris, with Cobie Smulders appearing in a recurring guest-role. The two had previously co-starred together in the long-running sitcom "How I Met Your Mother." In addition, Smulders and Will Arnet play a couple in this series, and coincidentally respectively voiced DC superheros Wonder Woman and Batman in the "Lego Movie" film series. Additionally, Nathan Fillion has a guest-spot in several season two episodes. Fillion co-starred with Harris in the web-series "Dr. Horrible's Sing Along Blog." 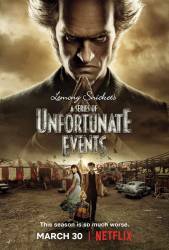 Trivia: Most of the episodes are written by franchise creator Daniel Handler, whom wrote all 13 of the original novels under the pen-name "Lemony Snicket." Handler also appears in a cameo in Season One as a fish-merchant, who quotes the song novelty comedy song "Fish Heads." ("Fish heads! Fish heads! Rolly-polly fish heads!"). Violet Baudelaire: Why do you hate us so much? Count Olaf: Because it's fun. Count Olaf: In all honesty I prefer long-form television to the movies. It's so much more convenient to consume entertainment from the comfort of your own home.